Having considered the benefits of working in a coworking space, the question arises, which coworking space should you choose in Bangalore? 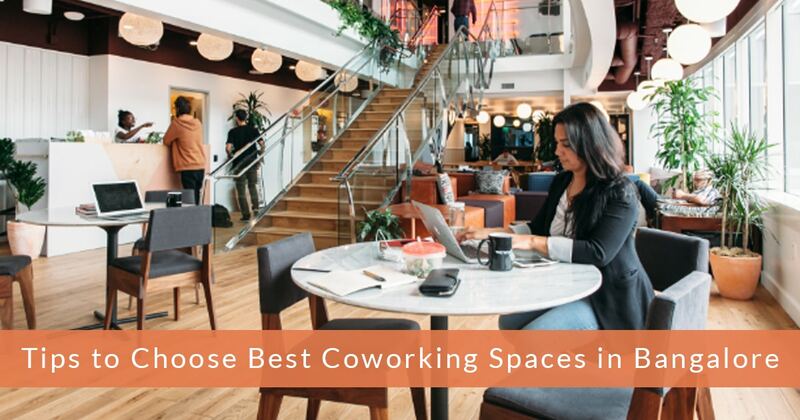 With so many coworking spaces out there, it can be quite difficult to find the one that’s most suitable for your venture. Nevertheless, Entrepreneur or freelancer should pay attention to when choosing a co-working space in Bangalore. Location undoubtedly should be the first priority in choosing the best coworking space. If you are business in to services, you should choose a location that suits best to your clients. You should choose a location that will leave a good impression on your first meeting with a prospect. Also location should be Ease of commuting for employees . However, choosing a location for coworking spaces in Bangalore like Koramangala will be the first option which is called the startup hub of Bangalore. Also you can choose locations like Indiranagar & HSR layout. While choosing a Coworking space, it’s important to check out the list of tenants or coworkers & companies that are occupying the space. If you are a freelancer and are looking for networking opportunities, choosing a coworking space that has professionals from various work domains can open up many doors for meeting other like-minded folks. If your coworking allows a trial period, make sure you meet the tenants and see if you are able to connect with them. Nothing is better than working in a jovial environment with passionate people. Places like a good Pantry, restroom that can be used and most importantly the Conference rooms/ Meeting Rooms is the place where a good team could be built. It is also been used to have meeting with clients and prospective ones. Find out if they have good facilities available with them. Also additionally the Good Internet connectivity, Fax Printers, Security systems like CCTV & security or office boy, UPS Backups, parking facilities. Also, amenities like play area is optional but actually plays a very important role in employee recreation & stress relief. I know this would sound emotional; then again the feel of the office means a lot. There are places which have good vibes and you would feel it right away. Trust me your employee’s also would feel that narratives. Imagine the place to be your fortress and find out if indeed it’s the right place to be in. Coworking spaces are the places of networking. A lot of coworking spaces in Bangalore organize weekly community events, including talks from successful entrepreneurs. Many of the events also bring in some very influential people and investors as the chairpersons, which is great for networking. Look out for these dynamic spaces, as such events may turn out to be useful in gaining exposure for your business. Of course, pricing is the major conclusion when choosing the coworking spaces in Bangalore specially choosing a place like Koramangala is very expensive. However, First best option would be Ataura Coworking Spaces in Koramangala located in the heart of Koramangala with all classy amenities & best & affordable price guaranteed. Wow thanks for this useful tips will really love to choose the best one after reading this interesting blog.